The Laserscope GreenLight PV laser is the premier system for the treatment of BPH (benign prostatic hyperplasia), or an enlarged prostate. This model is also known as the Laserscope GreenLight PVP laser system. Prostate health is one of the most important and in-demand segments of medicine, and the Laserscope PVP GreenLight laser gives you a cutting-edge treatment system that will set you apart from others and bring more patients to your business. The effectiveness of the Green Light laser therapy system has been clinically proven and is popular with physicians and patients alike because of its low rate of side effects and the fact that is does not increase the risk of TURP or TUR syndrome. Unlike many other treatment methods that are being used today, the Laserscope GreenLight can provide results using outpatient procedures with almost no downtime. 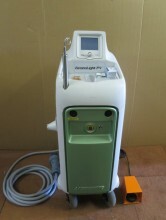 To get the lowest price on a Laserscope PVP GreenLight laser system, contact UsedCosmetic.com for a fast and free quote. Click the button below to add the Laserscope GreenLight PV Surgical Laser BPH Prostate Treatment Machine System to your wish list.